It's been more than 2 months since the last local fights, excluding the TCA finale and the hot chicks fights at Zouk. It's getting booooooring, anybody there?!?? :? We're really 8-[ to =D> our fighters. I just watched it!!!! It's AWESOME =D> =D> =D> A must see!!!!!!!!!! With the help of Joy, the Thai instructor at BXG, we made this short clips - how to do the muay thai hand wrapping. This is not the ultimate guide, we show you here two methods which you can use to wrap your hands for bag/pag work. There are tons of other ways to do it, probably every gym in Thailand has its ways. Here's some pictures I found of the girls that fought that night... I can't remember the names of the first two girls fighting but they were both bleeding by the second bout! I swear they were suppose to be just acting, to showcase how tough Muay Thai girls can fight, but I guess the crowd, adrenaline and music made them go all out! But that's what we want to see right? Starts at 8:00 PM on AXN SG time, it's a 2 hour episode. Yodsaenklai Fairtex won The Contender Asia title after the fight with John Wayne Parr of Australia. We are searching for 6 girls to take part in an event on 29th April, from 7-11pm. 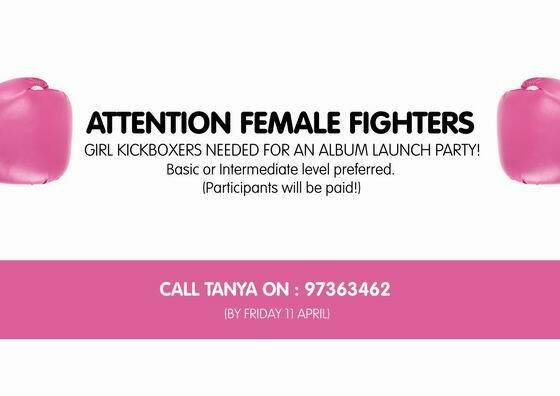 Girls will be required to take part in short 10min mock style fights, we only need a BASIC knowledge of kickboxing for sparring, nothing too serious. The event will take place in a nightclub and is to celebrate the launch of a new album for a high profile female artist. This is guaranteed to be fun, and we will pay all participants. Please get in touch by 11th April if you are interested. Took a week break from work and returned to my favorite island recently. The trip coincided with Zach's fight at Bangla Stadium and also the opening of Jomhod's new gym in Phuket-J.Prapar Thai Boxing Kiatadisak Gym. [acidfree:1546 size=297]Youth Park Tournament photos are here. MuayThai.sg is 1 Year Old! Crazy, huh? One year ago we started this site. The first covered event was the Muay Thai Tournament At Tanglin CC, remember? In those days we had only 10-20 visitors a day. Then on 19th of Feb we jumped to 55!!!!! and since then we climbing and climbing every single day. Lots of people helped to build and promote this website. Thank you all! Learn New Skipping Tricks and Styles! Attention all rope skipping enthusiast and beginners who wanna learn how to skip! Join us for a fun and energizing session of freestyle skipping at East Coast Park! FREE rope skipping lessons for the public! Services 16, 155, 196 to Marine Crescent or Marine Terrace and walk across the underpasses or overhead bridge. [acidfree:1356 size=365]Hey guys, might want to check out this fight. SMU is organising, NUS and NTU are also taking part. Get fight reports, episodes list, schedule, dirty stuff }:) , clips and more on The Contender Asia Fans website. Also, if you saw the fights "live" please make sure you sign up and share your impressions. [acidfree:1272]As one of my good friends said: "May the New Year bring you and your family lots of opportunities, good health and joy in whatever you do. Happy New Year!!!"